The global Kaposi sarcoma (KS) market is consolidated with the top two players accounting for a whopping 50% of the market in 2015. These two players are Johnson & Johnson and Merck & Co. Inc. Domestic players are unable to make much contribution to the growth of the KS market. However, this trend is soon to change, says a new report by Transparency Market Research. As per the research report, companies will be able to make more contribution after the patent expiry of popular drugs. The market is consolidated as many players are acquiring and merging with others so as to develop new products and enhance their efficacy. A case in point would be F. Hoffmann-La Roche Ltd. The company partnered with Joint United Nations Program, the Clinton Health Access Initiative, the President’s Emergency Plan for AIDS Relief, and the Global Fund, on September 2014 and launched a new Global Access Program. This new program was aimed at HIV viral load testing. 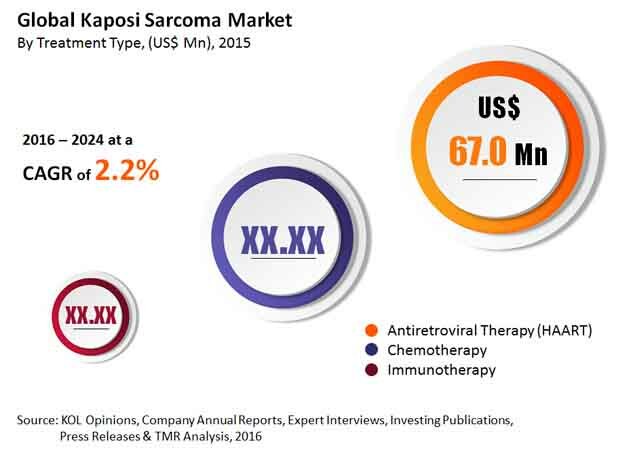 According to TMR, the global market for Kaposi sarcoma is expected to rise from US$118.5 mn in 2015 to be worth US$143.2 mn by 2024, expanding at a 2.2% CAGR from 2016 to 2024. By distribution channel, the hospital segment led in the past and is expected to continue to show the fastest growth in the coming years by expanding at a 2.6% CAGR during the period from 2016 to 2024. On the basis of treatment, the HAART segment led the market in 2015 and is expected to continue to be the leading type of treatment in the Kaposi sarcoma market. On the basis of geography, North America is anticipated to rule the Kaposi sarcoma market. However, the Middle East and Africa is expected to expand at the fastest CAGR in the forecast period. The growing incidences of cancer as a result of transplant of organs have become common. this in turn is responsible for the growing incidences of Kaposi sarcoma associated herpesvirus (KSHV) infection, reason being, patients who have undergone organ transplant are given immunosuppressive agents so as to prevent their body from rejecting the graft. This in turn makes patients highly susceptible to Kaposi sarcoma associated herpesvirus infection, driving the market. “The use of immunosuppressive agents on a long term basis fuels the risk of acquiring KS infection by 100 times,” says a TMR analyst. Another factor boosting the global KS market is the growing incidence of HIV/AIDS associated Kaposi sarcoma, leading to the adoption of HAART therapy. Cost of cancer drugs continues to be high and the use of cancer drugs for the treatment of KS is prevalent worldwide. Thus, many patients are unable to afford the expensive treatment. The price of patent drugs is increasing and shall continue to rise in the coming years, and thus poses a challenge for the global Kaposi sarcoma market. Chemotherapy drugs such as vincristine, paclitaxel, docetaxel, bleomicin, and liposomal doxorubicin enjoy high preference for the treatment of KS. However, the cost of all these drugs is extremely high, making it difficult for patient population across developing nations in Asia Pacific and Africa to afford them. This is limiting the adoption rates and hampering the growth of the global KS market.